How to Reach: Palolem beach can be reached very easily from anywhere in south Goa by hiring local transport and it is just 3 kilometers from Konkan railway station. The Palolem beach is the most popular beach in south Goa. 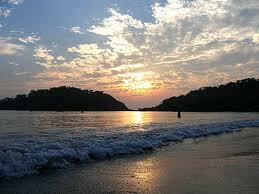 In fact, one can reach Palolem beach even from Karnataka in India, since it flanks Goa towards the south. The Palolem beach is considered to be the most photogenic beach in Goa since it has a crescent shaped coastline and fine white sand. The coast is lined with swaying coconut trees that form the most picturesque beach when seen in totality with the white sand and the blue sea. Many tourists frequent the Palolem beach yet it looks tidy and well maintained. One of the major attractions at the beach is the ferry rides that are provided for tourists to ride over the seas and spot dolphins. Don't be surprised to find dolphins cruising along suddenly with your ferry and if you are lucky they might come close enough for you to touch them. It is the perfect beach to relax and unwind with nature in its best form. The Palolem beach was discovered by tourists long back but it was developed in the recent past. Now, you can find seaside shacks and local stalls here that offer anything and everything that Goa is famous for like sea food, curios, souvenirs, beachwear, etc. The Palolem beach is usually filled with tourists and locals during the weekends, so if you are looking forward to calm down and loosen up go to the beach on a weekday. You will find few guesthouses and shacks here that offer accommodation, so it is better you come here to spend some time rather than come here to stay. Make it a point to visit the Palolem beach in Goa for an unforgettable experience.